Ice Hockey - 12. April 2019. 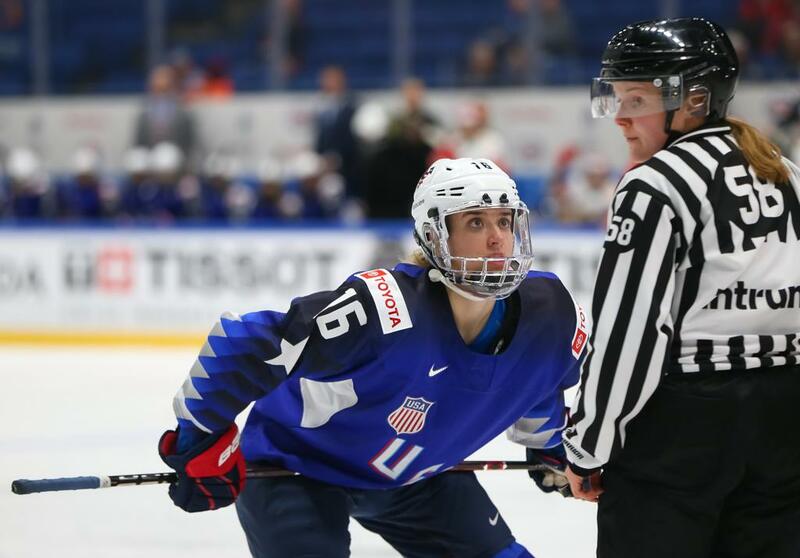 Cayla Barnes (Eastvale, Calif.), Dani Cameranesi (Plymouth, Minn.), Kendall Coyne Schofield (Palos Heights, Ill.) and Hilary Knight (Sun Valley, Idaho) each scored goals as the U.S. defeated Japan, 4-0, in the quarterfinals of the 2019 IIHF Women’s World Championship. The U.S. spent much of the first period in the offensive zone creating quality scoring chances, putting 22 shots on goal to Japan’s two. The effort paid off with 3:12 remaining when Hilary Knight (Sun Valley, Idaho) broke the ice for Team USA. Shelly Picard (Taunton, Mass.) took a shot from the right face-off circle and Knight was on the door step to corral the rebound and bang home the 1-0 score. Eight minutes into the middle frame, Sena Suzuki was called for a tripping infraction, sending the U.S. on its first power play of the game. With the advantage, Megan Keller (Farmington Hills, Mich.) ripped a shot from the top of the slot that bounced off Japanese netminder Nana Fujimoto, creating a scramble in front of the net. Both Dani Cameranesi (Plymouth, Minn.) and Knight got sticks on it, and they were ultimately able to convert to double the U.S. advantage. With 4:32 remaining in the second, Japan had a two-on-one opportunity that turned into a breakaway for its best scoring chance of the game so far. Maddie Rooney (Andover, Minn.) made a great save to maintain the 2-0 score. Just under three minutes into the final period, the U.S. increased its lead again. Amanda Kessel (Madison, Wis.) sent a pass through the crease to Cayla Barnes (Eastvale, Calif.) waiting on the far post to tap in Team USA’s third of the night. Kendall Coyne Schofield (Palos Heights, Ill.) joined the scoring halfway through the final period, finishing a rebound after a shot from Kelly Pannek (Plymouth, Minn.) was turned away by Fujimoto to make the score 4-0. Maddie Rooney (Andover, Minn.) stopped 10 Japanese attempts to seal the victory and complete her second shutout of the tournament. With the win, the U.S. (5-0-0-0/W-OTW-OTL-L) will advance to take on Russia in the semifinals on Saturday (April 13) at 1 p.m. ET. That game will be televised live in the United States on NHL Network.